Please don't use on Windows Programs(x86) or Programs! Please use for example %appdata% folder for QuickTextPaste because the Programs(x64) is write protected by Windows on Windows 10, 8.1, 7! For example Windows+E Keyboard shortcut and enter in the address bar %appdata% and create QuickTextPaste Folder! Portable application I personally store under D:\Portable if I re-install the windows again and again all on D: Apps Programs is ready for use ;-) mainly because I have per PC mostly 4-8 operating systems! Important ► Please use always ► ... the latest version of QuickTextPaste for Windows! (Image-1) QuickTextPaste in Programs(x86) or Programs? 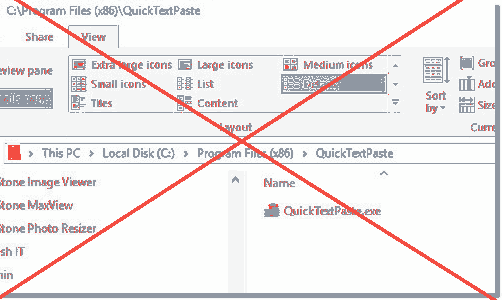 QuickTextPaste - FAQ-24: QuickTextPaste in Programs(x86) or Programs?